There's nothing like a hot bowl of soup when you've been sick and it's cold outside to boot. I was wanting soup to eat the other night, but didn't want to spend too much time with it. I remembered this recipe that I had bookmarked, so decided to give it a try. With just a few ingredients, including purchased ravioli, it packs plenty of flavor and was plenty filling for me. It goes together very quickly, which is an added bonus. I hope you'll give it a try. In a large pot heat the oil over medium heat. Add the onion and cook until softened. Then add the garlic and stir for about 30 seconds until fragrant. Add the oregano, basil, chicken broth, and tomatoes. Bring the soup to a boil and add the tortellini and cook according to the package directions. One minute before the tortellini are done, season with salt and pepper and add the spinach. Stir to combine. Dinner is now ready. Enjoy! This reminds me of a cypriot soup, which is made from a kind of tortolini which is filled with haloumi. Delicious, there is something great about finding big tasty pieces of filled pasta in your soup! It's cold and rainy here today - I wish I had a bowl of this soup. I like tortellini in the soup...a very soothing and tasty meal. This is one of my favorite "comfort me please" soup - yours looks so colorful and has to cure what ails you. 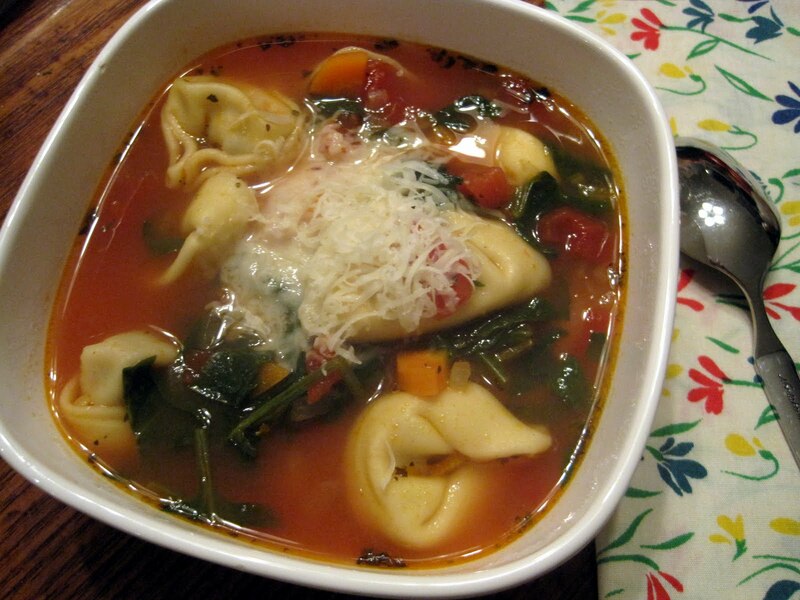 I love seeing those plump tortellini in the broth. Sounds like a wonderful soup - hope you're feeling better! Gosh that looks good, Lynda. I bet it freezes like a dream too. I always like to have soup in the freezer in case I feel too awful to cook! Now that's a good looking soup! I was rainy here in Florida today...perfect day for soup! If I wasn't having company this weekend for my kids' b-day party, I'd most definitely be making this! A nice bowl of soup sounds really good right about now!!! What a great & tasty idea! It is quick & easy to use store baught tortellini's too! I love spinach in soup. This sounds really good. I'll have to look for some tortellini! I made a similar soup a long time ago. It's so good I'll have to try this version. I've been down with a cold for like two weeks now, and would have enjoyed a bowl of this wonderful soup. Gosh, this looks good. Love its easy preparation and homey flavors. Making this soup as I type. Thanks for sharing your recipe. Already smells great! Tortellini soup is delicious. Another favourite of mine is Italian wedding soup!